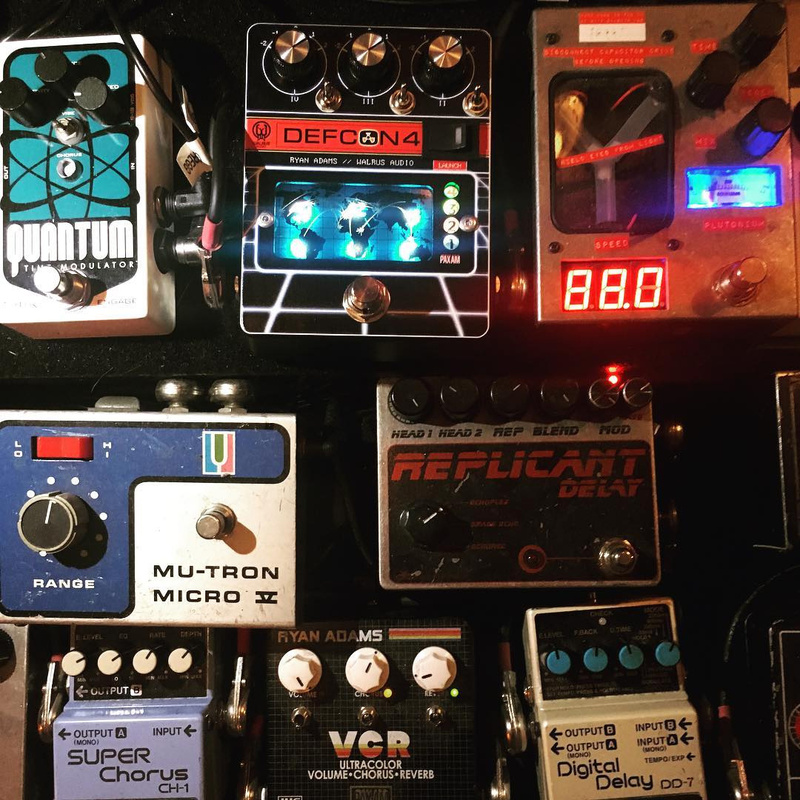 Over on Ryan Adam’s Instagram feed, he posted some shots of an upcoming pedal with Walrus Audio that has people talking. Not that long ago, Ryan collaborated with JHS to put out the VCR Ultracolor – Volume / Chorus / Reverb, and as he continues his quest for brainstorming new pedal concepts housed in retro-80s nostalgia. Coincidentally, I was watching TV the other day, and WarGames was one and I was thinking it had been ages since I watched it. Then the following day, I saw Ryan’s post..
“If you own a Strat and a Les Paul… Meet your best new friend. What do you think this pedal is about? Any ideas? Let’s hear it in the comments! Interesting. Let’s take inventory. Three pots, each with a switch miniature toggle switch. One large rocker switch. An illuminated map display with four small lights vertically stacked on the right labeled 1 through 4 (or are they also push button controls too?) with the term Pax Am at the base (Pax Am = American Peace…Pax is Latin for Peace) and a stomp switch where most Fx pedals would have one positioned. What else do we have? It’s hard to tell, but it appears to have one input and one output, although the output side appears to possibly offer two outputs…not going out on a limb or pushing this as absolute. The pedal on the right has a control where three of the letters on the label are visible. They are “dis” and suggest “distortion”. The pedal to the left is not adequately visible to discern much. 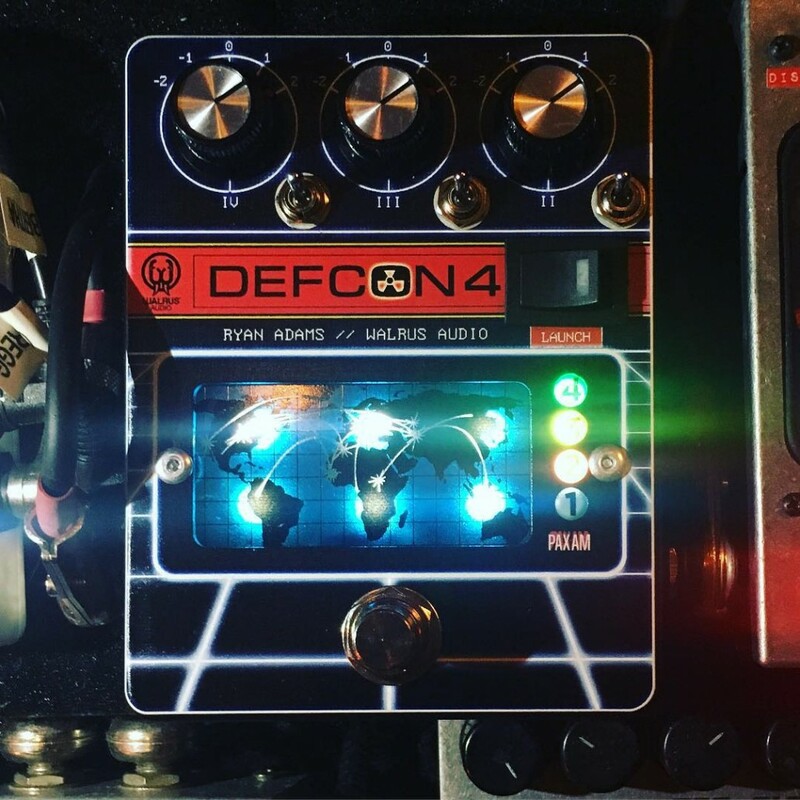 The DEFCON 4 pedal is on a separate tier above another row of pedals. I can’t speak for Ryan, but on my pedal board, pedals on a raised tier or row as this one is, is either rarely used or more commonly on my board are always on for either an entire song(s) or set…possibly even the gig. Ryan did state that the pedal was on every track. That it follows what I posit is a dirt pedal, that it’s always on, and that there are three major controls in the three knobs at the top, that those knobs have both (+) & (-) 1 & 2 with zero in the middle…I’m thinking more along the lines of a rotary switch instead of a potentiometer and that the three represent the Q for Bass, Mids and Treble frequencies with the numbers representing (+) or (-) 1 or two octaves with the zero being the center frequency of what amounts to some sort of parametric or semi-parametric Eq Pedal. I’ll speculate that the toggles are for shifting the frequency center of each knob and the launch is a gain boost of some sort. The vertical 1-4 I’ll speculate is akin to a peak level meter, but for what purpose I’m not sure. The comment about the Strat and LP…I’ll speculate that the pedal allows one to imitate the tone of the other by stepping on the switch and activating the pedal. That’s all I got Hank. We’ll have to wait and see. Hank…what do you speculate about this pedal’s raison d’être? You are the master and we are humble apprentices…what opinest thou our wise and knowledge-imbued Sage?